An animal model research herd with extreme diversity in genetic fertility has been established. A huge logistical exercise that involved collecting hundreds of calves from farms all over the North Island has set the scene for a ground-breaking research project aimed at lifting fertility rates in the dairy industry. Carefully planned contract matings have produced two groups of heifers which have extreme differences in their fertility breeding values. These heifers were born in August 2015, and they will form the 'animal model research herd'. How accurate is the current fertility breeding value? What new traits (phenotypes) can we measure and/or use to help us predict fertility? What underlying physiology is driving differences in fertility? An increased understanding of the fertility trait will lead to better management on-farm, as well as enhanced genetic selection. Better fertility in the national herd will directly impact cow health and longevity, delivering high economic returns, as well as improving positive public perception of the dairy industry. Building the animal model research herd required the contract mating of 2800 animals: 1340 high fertility cows with 24 high fertility bulls; 1516 low fertility cows with 46 low fertility bulls. Calves were collected within two weeks of birth, in an effort to minimize the impact of different management conditions on-farm. All calves were reared together at a facility in the North Island. The heifers that make up the animal model are Friesian. This is because the Friesian breed has the biggest diversity in the fertility trait, as well as the largest population of any dairy breed in NZ. Breeding values for the two herds are similar for all traits except fertility. Fertility is incorporated into Breeding Worth (BW), and so the low fertility heifers also have a lower average BW. Each animal will be monitored throughout growth and into their first and second lactation. The following are some of the focus areas for data collection. Measuring puberty and the strength, length, and regularity of oestrous in the research herd. Each of the animals is wearing a pedometer device on a collar which senses their activity. This is used alongside regular progesterone measures to identify when each animal is in heat. Age of puberty could be a good indicator of a cow’s future reproductive success. It is likely that heifers that reach puberty early because of genetics also have the necessary characteristics to cycle quickly following calving. This is a real bonus for cows needing to get back in-calf in a seasonal calving system. In this research herd, puberty is measured by looking at the progesterone levels in blood. The heifers were blood tested every week and puberty was defined as having two consecutive, or alternatively two out of three, plasma progesterone values that are above 1 nanogram/ml). High fertility heifers reached puberty at an earlier age (358 vs. 379 days) and a lighter liveweight (271 vs. 296 kg). Both groups have very similar estimated mature liveweight, and so the high fertility group are also reaching puberty at a lower proportion of their estimated mature live weight (51 vs. 55%) compared with Low fertility heifers. 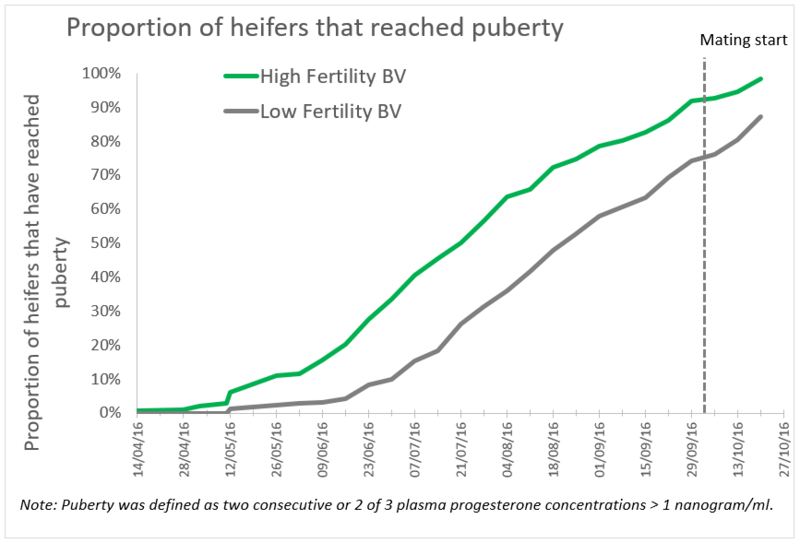 When breeding started, 93% of the high and 76% of the low fertility heifers had reached puberty (based on two plasma samples with high progesteorne hormone). By three weeks after breeding start, 99% of the high and 87% of the low fertility had reached puberty. Submission rate: Did the cow come up for mating in the first 3 weeks of mating? Calving rate: Did the cow calve inside the first 6 weeks of calving? These two measures, along with a range of other more detailed measures will be collected for each animal in the research herd. Data from this trial will allow us to validate the current animal evaluation model, as well as identify opportunities for improvement. The heifers were bred to Jersey bulls, starting from 6th October (2016), bulls were removed on the 4th Jan 2017. Aged pregnancy diagnosis occurred through December 2016 to Feb 2017 to capture all pregnancy. More high fertility heifers were pregnant earlier with 90% vs. 81% pregnant after six weeks of mating. Pregnancy loss (**), in a cow will 'reset' the reproductive cycle, and the cow will return to oestrus cycling. If this loss occurs early, it can be interpreted as a cow failing to conceive. Fewer high fertility heifers lost pregnancies during the 5 months after the start of mating (from Oct 16 to February 17) (2% vs. 4%). As the heifers grow, their liveweight will be closely monitored. The graph shows the liveweight when heifer calves were collected through to 76 weeks of age (19 months). 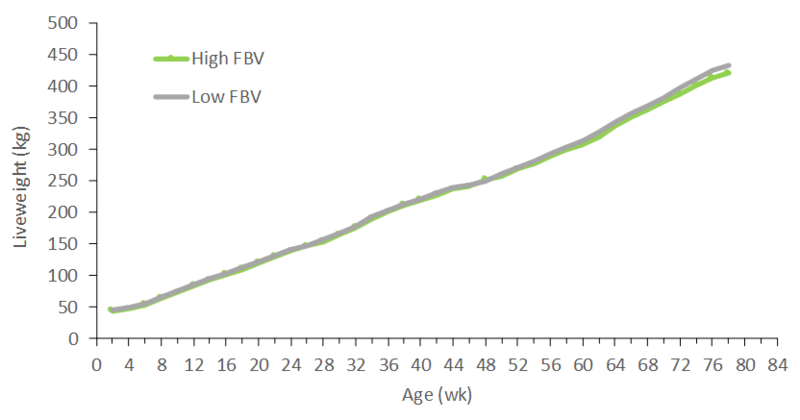 The high and low Fertility BV heifers grew at similar rates as heifers, with similar size and stature in the measures of size and stature at 6, 9, 12 and 15 months of age (refer to table below). Stature comprised of measures including girth at the shoulder, length from the shoulder to tail-head, and height at the withers. In addition to looking at a wide range of new traits (phenotypes), the research team will also be measuring the underlying physiology of the heifers. This will be powerful information, especially as it can be paired with such detailed animal trait recording. Measures will include hormones, uterine environment, oocyte (egg) health etc. The following are some of the focus areas for data collection. Measuring the strength, length, and regularity of oestrus events in the research herd. Each of the animals is wearing a pedometer device on a collar which senses their activity. This is used to identify when each animal is in heat and evaluate the strength, length and regularity of oestrous. 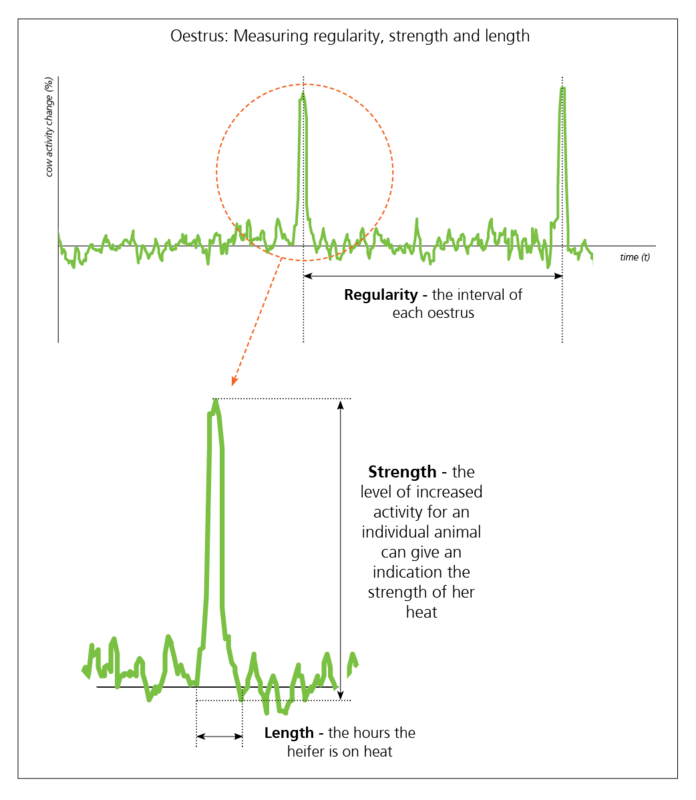 The following image shows an example of what researchers might see in terms of a heifer’s actively (green line) across multiple cycles. A cow that comes on heat regularly (every three weeks) will get more opportunities to be mated during the mating season. The research team will measure how regularly these heifers come into heat, to determine whether this is a trait which drives fertility. Interestingly, the high and low fertility heifers both had 55-60% of heifers ovulate without expressing oestrus at the first ovulation. A measure we could determine by comparing the data from the pedometers and plasma progesterone hormone concentrations. The high fertility heifers had one more heat before breeding started, which is expected as this group reached puberty 21 days earlier (heats before breeding, high fertility had 4.5 heats and the low fertility heifers had 3.4 heats). It can be easier for farmers to identify cows for insemination in cows which have stronger heat. The research team will measure the ‘strength of heat’ in the heifers, to understand whether this is a driver of fertility. 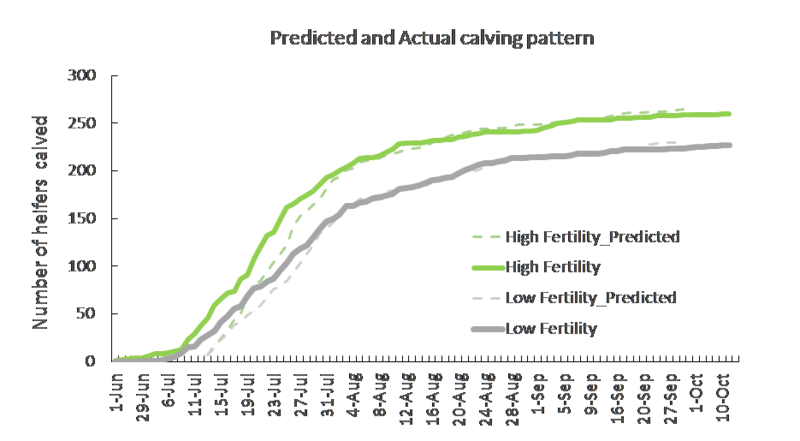 Preliminary analysis of the oestrus events prior to breeding start, identifies that the length of the heat events are similar between the high and low fertility heifers (about 16 hours). The high fertility heifers did have a stronger heat (greater activity level). During the first three weeks of mating, when long and strong heats are important for mating success, the high fertility heifers had longer heat events (13 hr vs. 11 hr), and the heat events had greater activity (were stronger). With the heifers showing differences in oestrus expression, we also expect these difference to be there for their second mating, which started in early October. All first lactation cows will be mated using AI, and we wait to see whether the difference in heats affects submission rate. Counting how many follicles are visible on the ovary of the heifers is a measure that uses ultrasound and can be taken on-farm. International and NZ studies indicate that this measure is related to future fertility. The research team believes this could be a novel trait that could be included in selection for heifers that have higher fertility. Ultrasound imaging is being undertaken in September and October 2016. Results from the scans undertaken at 3 to 6 days after oestrus identify no difference between the high and low fertility heifers for the number of follicles present on the ovary (26 vs. 25 follicles). Heifers ranged in how many follicles were evident and account from as few as 5 follicles to over 50 follicle. We also measured the hormone that is linked to follicle numbers and Anti-Mullerian Hormone (AMH) which followed the same result as with the number of follicles, the concentrations were not different between the high and low fertility heifers (2.26 and 2.29 nanogram/ml). These two measures do not seem to be associated with the fertility breeding value. As the heifers matured, it was of interest to see how calving eventuate. Calving is complete. The heifers calved a little earlier than expected the number of heifers calved for the high and low fertility groups are outlined below. The 2017 mating is the first using AI, with all animals being AI’d for the 12 weeks of mating. The mating strategy in place aims to produce replacement heifers, and support unbiased collecting of submission, conception and pregnancy data. To that end, interventions have been delayed to the start of the seventh week of mating. This decision is to achieve the research objective, of collecting reproductive data unbiased by early reproductive interventions. Mating started on the 9th of October, and to date (24th October), 277 cows have been submitted in 16 days (approximately 17 per calendar day). The high and low fertility cows will be closely monitored through their first lactation, with the focus on the collection of reproductive phenotypes. This will be regularly updated - check back to see how the groups are tracking. Use the arrows below to view a timeline of events for these heifers.